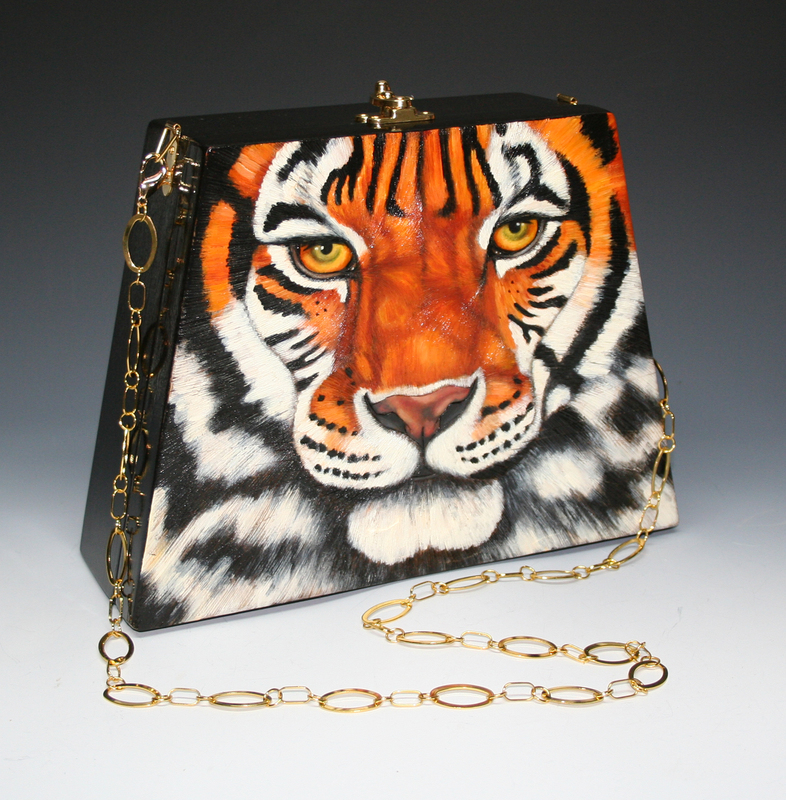 A few weeks ago when I was in the studio finishing work on the big cats handbag, I was listening to part two of “Oprah’s Favorite Things” to help pass the time. 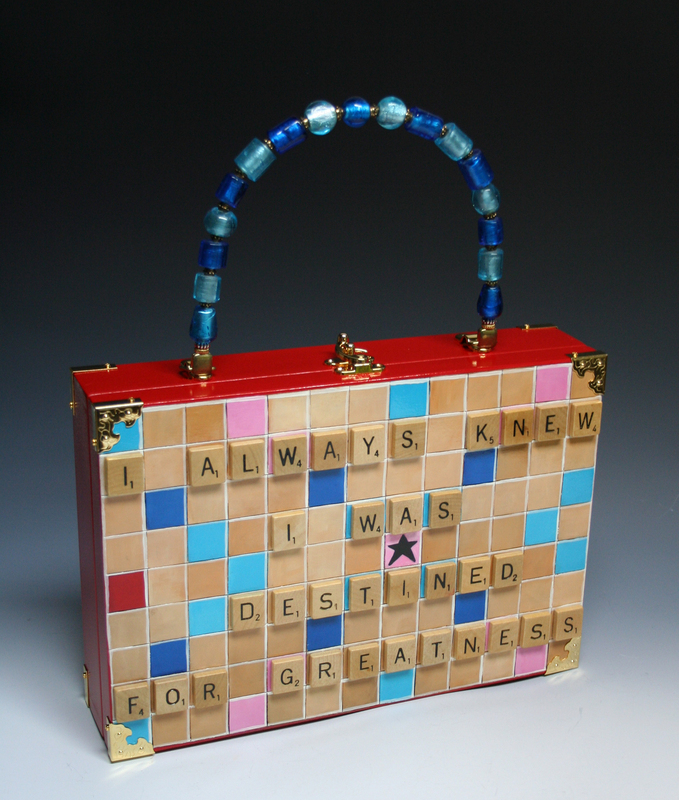 When I heard Oprah say that she is a huge Scrabble fan, I looked up with great interest, since Scrabble handbags are not only fun for me to make, they are also one of my most popular accessories. By the following afternoon, I had a custom made Scrabble handbag and a handmade clutch ready to go in the mail along with one of my new 2011 calendars, a brochure, biography and letter of introduction. I decided to send the bag to “O Magazine” because I have seen video of the piles upon countless piles of mail she gets at Harpo Studios in Chicago every week. And, anyway, I’d sent a pair of gourd masks to one of her producers about ten years ago and never heard anything back. Last April when I found out that Sascha Obama had decided to make saving the tigers a priority in her young life, AND that the Obamas were set to visit the Grove Park Inn in Asheville, and I dropped everything I was doing to create a leopard evening bag for Michelle, a tiger tote for Sacha, and a cheetah tote for Malia. After packaging the bags in boxes lined with matching prints, I drove up to the The Grove Park Inn to deliver them, but alas, they wouldn’t let me leave the gifts, so I mailed them off to the White House that same day. My point is this. I have never been one to let an opportunity pass to promote myself or my work, because I have to believe that somewhere along the line something amazing will happen, that the right person will come along to propel my career into the stratosphere, that whoever I have been waiting on, or whatever I have dreamed will unfold, whatever chance encounter, or opportunity I once acted on that “never went anywhere” (at least not in my time frame) is all part of a larger plan that I have no control over, but which I chose to continue to believe will happen, even when it seems as though I have run up against a brick wall. I believe in serendipity and in the idea that even though I might be ready for the next phase of my career, the people and events that will carry me to the next level, might not be in place yet. I haven’t heard back from either Oprah Winfrey OR Michelle Obama, but you never know when the phone might ring, or who might be reading this blog and think, I can do something to help this along. I know Malcolm Gladwell thinks that there is no such thing as luck, that people only get to where they want to be based on where they were born and what family they were born into, but I believe that while family dynamics play a role in how we start life, the choices we make about what to do with the talents we’ve been given as we grow up, can take us where we want to be, even if the journey takes longer than we would like. Or to be more accurate, where I would like because, as I have said before, I was ready to “be somebody” when I was twenty. Thirty years later, I am STILL ready to be the next Prada, or Gucci, or Balenciaga. And while I don’t have the money or the prestige, I have the drive, the goal, and the desire coupled with the steadfast belief that I didn’t get the talent I have by accident…there has to be a reason why things haven’t happened the way I have wanted…..